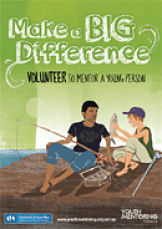 The New Zealand Youth Mentoring Network is pleased to announce registrations are now open for our upcoming biennial National Youth Mentoring Conference to be held at the Ellerslie Event Centre, Auckland on the 10th and 11th September 2013. The full conference schedule is currently being finalised and will be published shortly. As part of the Children's Action Plan, Government announced a raft of actions and initiatives to identify, support and protect vulnerable children and young people. The plan specifically recognises the powerful and and positive influence supportive mentoring relationships can have on the lives of y oung people. Government is encouraging adults to volunteer their time so that more vulnerable young people have the opportunity to benefit from a mentoring relationship with an experienced adult by promoting youth mentoring through existing mentoring programmes. To date, we are pleased to announce nine mentoring programmes are being promoted as part of this initiative. At the same time, Government recognises that looking after the safety of young people is paramount to the effectiveness of youth mentoring relationships. To support this, the Ministry of Health, the lead agency for this Children's Action Plan initiative, has partnered with the New Zealand Youth Mentoring Network to develop safe practices guidelines for providers to review and develop their programmes. If you are a programme provider, and would like your programme to be part of the promotional campaign, you can register your programme with us. If you are interested in becoming a volunteer mentor, you can also register with us. In the recent budget Government announced an initiative for a nationwide mentoring scheme, with a total investment of $5.871m over four years. Application dates and processes are yet to be released, however we understand community groups will be able to appy for funding to provide these services later this year. have approximately 1,500 young people mentored. MentorPlus - Wellington workshop - book now! 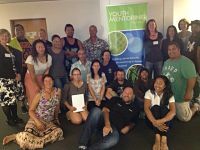 20 attendees from an array of organisations working with young people in the community recently attended our 2 day workshop in Auckland on the 30th April / 1st May. We are now running our Auckland based courses at the Rose Park Hotel, Parnell. With a pool right outside the training room, everyone enjoyed paddling their feet during the lunch time break - hard to believe it was only a month ago, with the wintry polar blast we are all experincing now! We are pleased to be able to extend our training and support services to provide tailored sessions to meet your organisation's specific needs. 'This training has given me more confidence - the top tips I need to implement our new mentoring programme'. Kelsey Lyman, YWCA Hamilton. If you have specific training and support needs you would like to discuss then please be in contact.